And now for something completely different. Back in 2009, I decided to check out some of the annual Phuket Bike Week event which takes place around the same date as Songkran (April 13th) every year - 2018 will be the 24th time the event has been held. During the event, Phuket is full of big bikes ranging from Harleys to big racing bikes and plenty of amazing custom built choppers. There are bikes on show at the JungCeylon mall at Patong Beach, there are usually events/live music/food stalls by the beach in Patong (at "Loma Park" towards the north end of the beach) and bike rides around the island. If you are here, you will almost notice something going on! I'll maybe go back another year and get some new photos. Photos on this page were all taken in 2009. 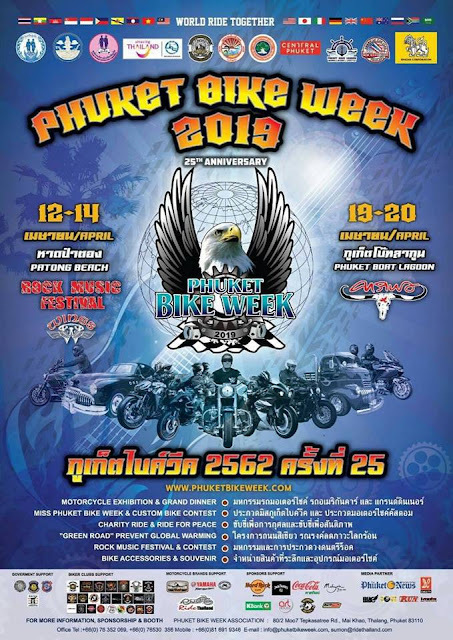 Phuket Bike Week 2019 will take place at Patong Beach from 12th - 14th April 2019 - There is more information on the Phuket Bike Week official website. There will be an additional 2 days on 19th - 20th April at Boat Lagoon Marina, north of Phuket Town. Laziness set in - the Friday night beach party included a concert by Carabao, a very popular Thai rock band, but my wife and I were too tired... On Saturday afternoon I headed down to Patong Beach with my daughter to see what was going on. There was meant to be a "ride for peace" in the afternoon, with hundreds of bikes riding from Patong to Phromthep Cape via Karon and Kata beaches. I hoped to see the start of the ride and hear the roar of throaty engines! Along the road were many food and drink stalls selling burgers, phad thai, chestnuts, fried chicken, satay sticks, mango with sticky rice, fresh juices and beers, plus lots of stalls selling leather bikers clothes, tshirts, Bike Week souvenirs and more. Oh, and big bikes too! And along with the bikes, the bikers! They come from all over Thailand, and also from Singapore, Malaysia and indeed all over the world. If you want big bikes and fun in the sun, Phuket Bike Week is the place to be! I do like the bikers gear - leather jackets with club membership patches. It all looks very tribal, but I reckon these burly bikers are all jolly nice folk who love kittens! The bikes are a mix of custom jobs, big Harleys, sporty models, some 3 wheelers which are nearly as big as my car, all kind of bikes! It's almost enough to make me want to buy a chopper.. or just a leather jacket. Phuket Bike Week is well established in the Phuket event calendar. If you like bikes or want to find some live music and food on the beach, the Bike Week has a lot to offer. Most of the events take place in Patong - see here for some Patong hotel suggestions.